Adapted from Francois Boucher’s La Toilette de Venus of 1751. Does anyone recognise the title I’ve stolen? Clue: Think of the books you read as children. The older you are, the better placed you will be for finding it familiar, even if you haven’t read it! First of all, a quick note to say that I’ve almost run out of bandwidth this month (we downloaded a couple of films for the holidays) and I have to make what’s left last until 7th January. This is why I’ve not been doing my usual round of blog visits, alas, and won’t be able to until the 8th. A surreal piece created in Photoshop with various family photographs, a clock face created for Behind Time using a photo by Rachael Towne on Flickr, a texture from 2 Lil’ Owls, and a fish from The Graphics Fairy. I’d like to dedicate this post to writer Jo Robinson whose husband passed away suddenly on Boxing Day. It was cruel timing and Jo will have more than the blues to come to terms with now and in the months ahead. I have not stopped thinking about her having to bear such a terrible loss and send her much strength to withstand the tragedy. Take heart, Jo. We’re all thinking of you. One year I was so bored with the usual tat for Christmas and the lack of anything different that I created An Italian Christmas, having discovered that the Italians traditionally eat fish at this time of year, especially on Christmas Eve, The Feast of the Seven Fishes. Visit Cooking with Nonna for several Italian fish recipes for Christmas, but not until you’ve read my recipe for Kedgeree below! This image was created using one of my textures and a photograph I took of some Cretan fish which we barbecued. A friend had brought them over and did give us the Greek name but I’ve long since forgotten what it was! The closest I can give you is whitebait. They were delicious cooked on our barbecue, an interesting ramshackle affair built by Mr FND with some of the rocks dug up from the garden. I don’t know whether Italians ever have any form of Kedgeree at Christmas but since I currently have a craving for it, I thought I’d give you my adaptation, which uses smoked mackerel and common or garden rice rather than Basmati. Incidentally, it’s not a genuine Indian dish but hails from the time of the British Raj. Serves 4 with average appetites (2 with greedy appetites like me and Mr FND). Tear the parsley into pieces. Remove the skin and flake the smoked mackerel fillet. Hard-boil the eggs, shell and cut into quarters. Slice the red onion and use a frying pan to soften in oil. Add the curry powder and nutmeg and stir. Cook for a minute or two. Add the uncooked rice to the mix and stir until the rice is coated with the oil. Add 3/4 of the fish stock and leave on simmer for as long as you would normally cook rice. Test whether the rice is cooked. Add more stock as necessary but don’t have it ’swimming’ in stock. Turn down the heat. Add the butter and stir until it has melted. Add the mackerel flakes and the egg quarters, half the parsley, stir and season to taste. Turn up the heat a little before serving in your favourite dish and decorate with the rest of the parsley. Serve with slices of fresh lemon. Like all my recipes, this is only a guide. If you want to add more eggs or less curry powder, for instance, feel free. 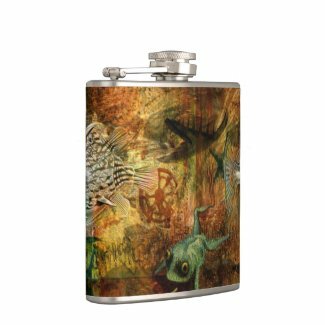 Layer upon layer, clip art upon clip art and texture upon texture went into the mix for this ‘fishy’ collage. All mine own. This a very early piece and I thought it could do with some fresh air. So here it is! A gentle touch of steampunk to start the week. I’ve used the reverse of one of my vintage postcards and added an almond green texture. To this I have placed steampunk ephemera from Design Cuts, and a fish from The Graphics Fairy. 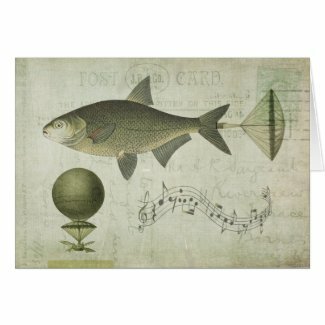 Flying Fish Greeting Card at Zazzle. Have a lovely week and be kind to everyone you meet. Today’s Special is from three years ago, created with an American paddlefish illustration that was photographed by Timothy Knepp of the United States Fish and Wildlife Service, and a 19th century French menu, both from Wikimedia, as well as textures from my collection. Somebody recently commented on it at Redbubble and I hadn’t looked at it for ages. It was rather better than I remember! Roll up, roll up! As from today it is available on tote bags, duvet covers, mobile phone and iPad covers, as well as the usual posters, greeting cards and framed prints. Don’t say I fail to cater to your every desire! It really is astonishing what can be achieved with digital art software — in this case, Photoshop. I was playing around with a map and a fish (from The Graphics Fairy), and a photograph of a setting Cretan sun — no, please don’t ask why this combination! I discarded the map and selected the sun area of the photograph to make it the background. I then went through all the available blending modes for the salmon layer without success until I came to one near the bottom called ‘difference’. Immediately I was struck by the effect and it is what you see here. It reminds me of etching on copper scraperboards (scratchboards in the US), which I once tried my hand at. Unsuccessfully. A little something for Saturday morning that I created about four or five years ago from photographs taken while on holiday in Crete. We took a boat trip from the Venetian harbour in Chania, avoiding the modern, glass-bottomed variety in favour of an old wooden fishing vessel — at least I think that was its former use. To our surprise, the windows and portholes were stained glass scenes of fish in the sea and rather delightful they were too. 1930s? I’m not sure. 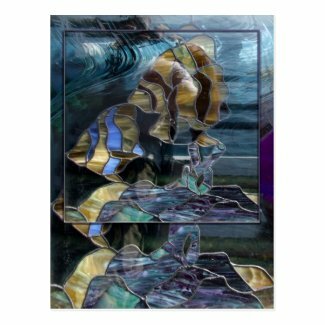 Back home, I layered the photos one upon the other to produce Stained Glass Fish.